Calling All Cast Members…For Disney In Pictures! Remember that Sunday’s Disney In Pictures theme is Cast Members! Do you have an incredible story to tell about a CM that just blew your socks off? Do you have a photo to go along with the story? If so, send it on over to us and we’ll include it in this week’s post! Simply email your photo to mickey@mydreamsofdisney.com, include your name, why the moment is special to you, and include your blog if you have one. It’s that simple! Also, don’t forget that we are teaming up with Chip & Company on a 2nd Birthday giveaway! We’ve got a $25 Disney Gift Card and a Disney Fantasy Inaugural Cruise Photo Album to share with one lucky winner! Have you entered the contest? If not, you might want to get going on that! The contest ends Saturday, September 15, 2012, at 11:59PM, so time is running out! Good luck! One of the rides at Disney’s Animal Kingdom that is actually more fun then you would think is Primeval Whirl. When we first visited Animal Kingdom in 2007, Sophie wanted to ride the ride so badly — but she was unable to do so because she didn’t meet the height requirement of 48 inches. Primeval Whirl is a roller coaster, but not in the traditional sense. It’s kind of like combining a roller coaster layout with a tea cup rotation device, and that turns out some thrilling, exciting spins, twists, and turns! 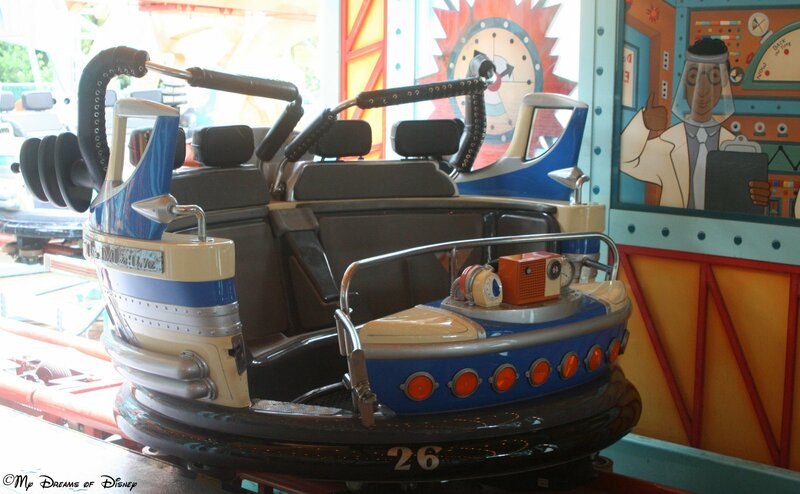 As you can see, the Time Machine you will travel in to take you back in time to the age of dinosaurs is a circular vehicle, and it seats four people. The key to the ride is the circular motion, because believe me, that design will spin you around and around and around at parts of the ride, and it’s a lot of fun! Another neat thing that I like about the ride is that the track is setup so that it has a lot — and I mean a lot — of 90 degree turns! That way, as you are speeding on your way towards the edge, you think you are going to fall, and you turn right at the last moment, such that you are able to see over the edge! That turn also sets your car to spinning, so I hope you are not motion sensitive — if you are, this may not be the ride for you! 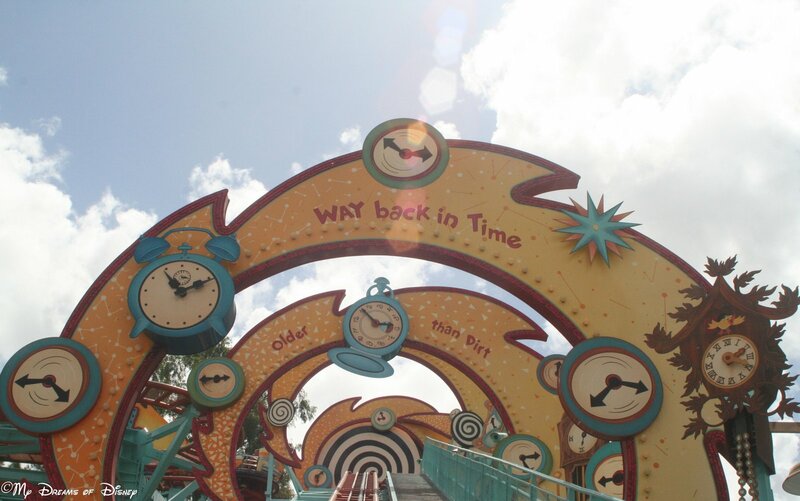 As you climb up the hill, you will notice that the ride it taking you back in time! This is evident because the clocks you see will be moving backwards. It is after you reach the top that your trip really takes off! All in all, this is a fun little ride for Sophie and I. My wife can take it or leave it, and I guess I can too. It wasn’t one that I rode this past trip, but I think the next time we visit, I will ride it again. 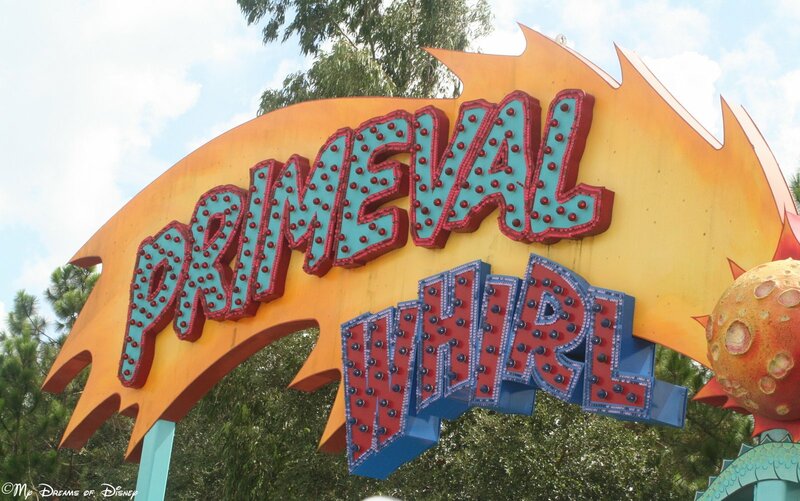 What do you think about Primeval Whirl? Is it a ride that you like to enjoy, one that is “one and done”, or one that is a must do ride? Let me know in the comments or on the Facebook page, and thanks!